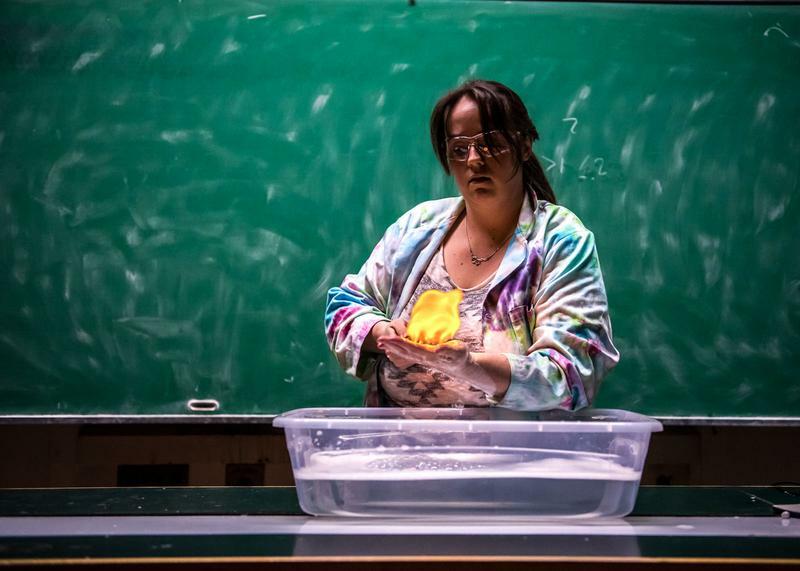 First-year science students will know Angela Crane by her tie-dye lab coat and the enthusiasm in her voice in anticipation of a reaction about to take place in the chemistry lecture hall’s fume hood. In addition to lecturing, Crane performs all the demonstrations in first-year chemistry courses at UBC. For almost every topic covered in class, Crane consults a large book of demos and performs the most “flashy” and memorable for students. It was a first-year chemistry professor at Memorial University in Newfoundland and his memorable demonstrations that led to Crane’s decision to pursue chemistry. The moment stood out to Crane because it was so unexpected, yet reinforced what she was learning in class. Working alongside a professor in a research lab in her second year of university only intensified her interest and set her on the path to making chemistry her future career. Outside UBC’s classes, Crane is involved in the chemistry department’s outreach, performing demonstrations for schoolchildren and kindergarten classes. The role came to her naturally. As a girl guide leader, Crane was already organizing activities that would introduce the girls to science at a young age. She was also already a seasoned performer. As a graduate student, Crane stayed at Fort Nelson for a month as a “live-in scientist.” She demonstrated chemistry reactions at the six schools in the region and organized hands-on experiments for the students. For the last two years, she has been training other graduate students to do the same. She builds new programs and labs each year like soap making and food chemistry labs resulting in edible products. Outreach for children isn’t the only way Crane brings chemistry outside the lecture halls and labs of UBC. Crane is also involved with the Vancouver Police Department’s hazmat training, helping first-responders learn how to extinguish fires involving thermite, gun cotton, alkali metals and even diethyl zinc, “which is scary,” Crane noted.